Have you ever been in the cosmetics section of your favorite department store but could not find a new color that would suit you? I have! I have always thought of myself to be exciting and daring, but being of the darker color I was always skeptical! You will be amazed how a good reliable lip color can pull together a outfit, but don’t be afraid to experiment within your realm of color. Various colors compliment different skin tones and textures, and There is no reason you should be missing out on the compliments you will revive! They will flood in believe me! 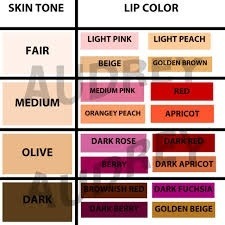 Check out this color scheme chart and start shopping for your new FASHION FORWARD LIP COLOR!